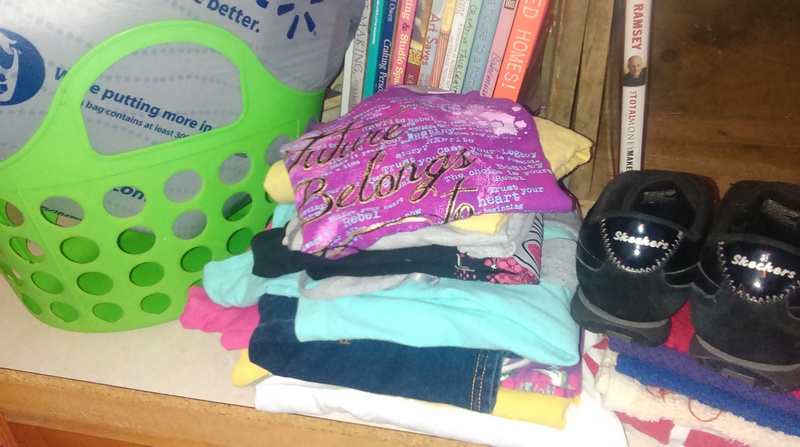 Another storage basket that was going to solve a problem – donate. Some more clothes that we are dealing with as they come out of the laundry (that is finally caught up, again) – donate. A pair of shoes that have been outgrown. This was mentioned by the wearer on the way home from the shopping trip to replenish her outgrown wardrobe. Next check and these will be replaced. These will be donated. A bag of assorted fabric and other craft supplies that aren’t loved – donate. And finally, a pile of excess kitchen towels. The more towels I have is directly related to the length of time between laundry loads. If we only have a few, I will need to keep up with the laundry. That’s the plan anyway. Also donate. Another trip to the thrift store, but only to drop things off. I’m not buying anything. I promise myself. Less in and more out. On our way to a simpler, less cluttered life. I can rest easier knowing that progress is being made!